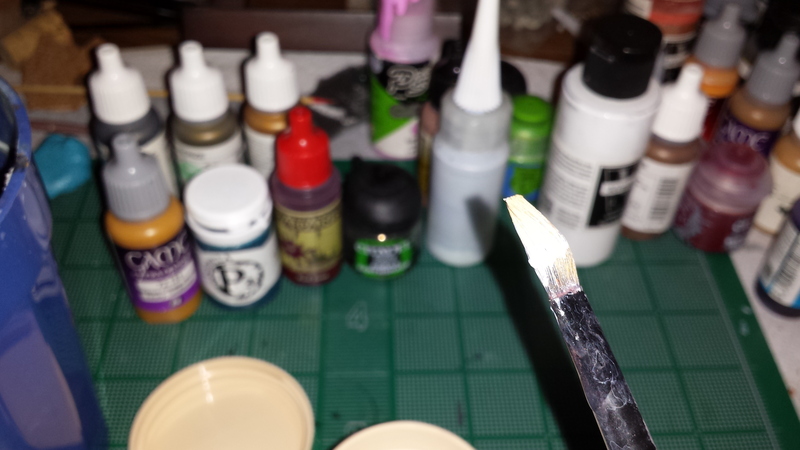 Arguably the most important tool you will ever have to make a choice on when you are a miniature war gamer is the paint brush. 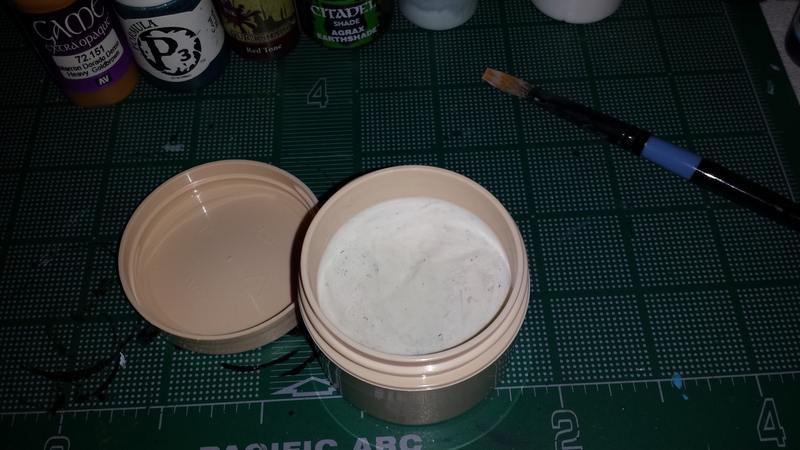 Beyond anything else, this is the most common way to get paint on your miniatures. 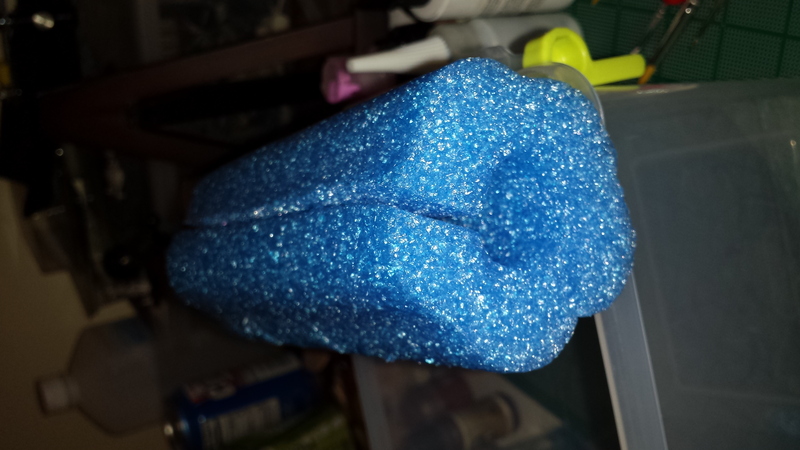 Even folks who utilize an airbrush still need to dip bristle in paint for those details and that extra control. 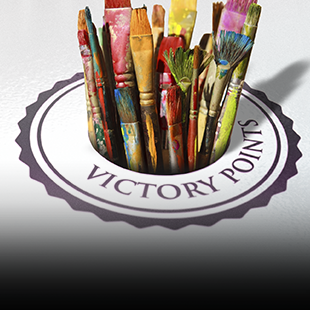 Now, there are a lot of different beliefs on how you should choose your paint brushes. 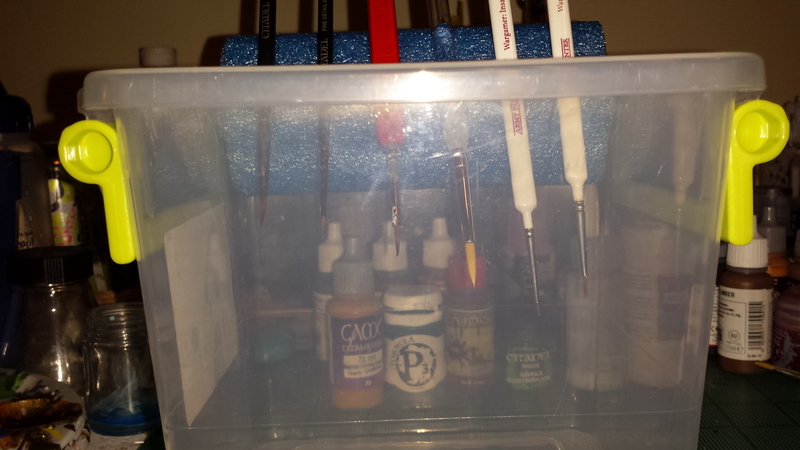 Some favor very expensive professional brushes, others brushes designed specifically for miniatures, and others favor whatever cheap acrylic brushes you can get at the local hobby or craft store. There are pros and cons to each school of thought. The basic construction of a paint brush is simple. The handle can be anything from plastic, acrylic, metal or wood of varying nature or make. The handles account for most of the weight and balance of the brush, and also determine how you will grip the brush while using it. The Ferrule is the part at the end of the handle that helps to secure the fibres to the handle. This can be made of plastic, metal or really any other rigid and tough material. 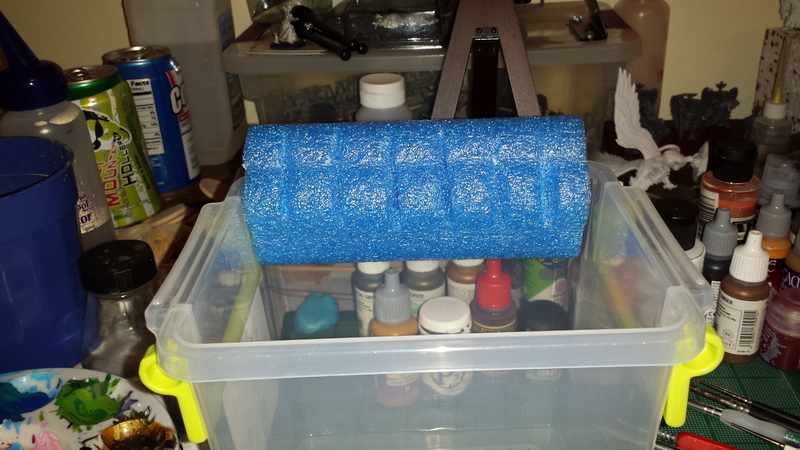 Not only does it keep the handle and the brush hairs together, it also strengthens the end of the handle to help prevent splitting or warping, as that will be where most of the pressure and tension will be while you're painting. The actual fiber part of the brush tends to be the most important and it can range from materials of Synthetic Fiber, Nylon, Mongoose hair, Squirrel hair, Sable and Kolinsky Sable. There are other possibilities, but those are the ones you will likely hear about the most. 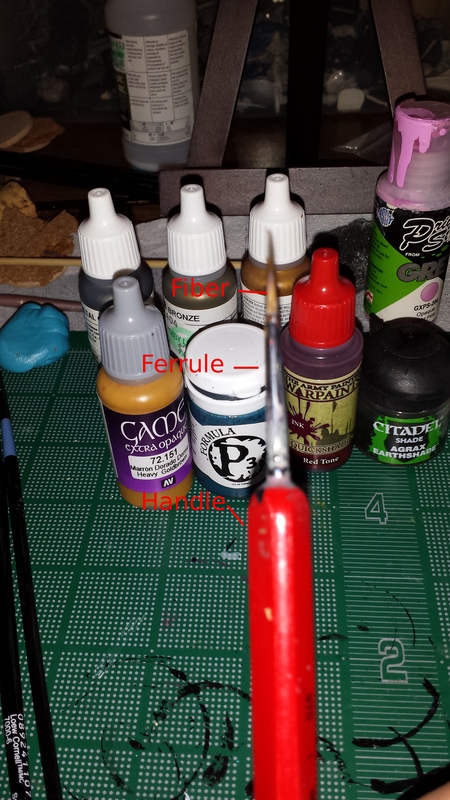 This material will be responsible for carrying your paint in the belly of the brush, as well as delivering it onto the miniature as you want. These are often graded by their durability, cost, spring and the ability to retain their shape and point. Materials have varying costs, as well as pros and cons associated with each. 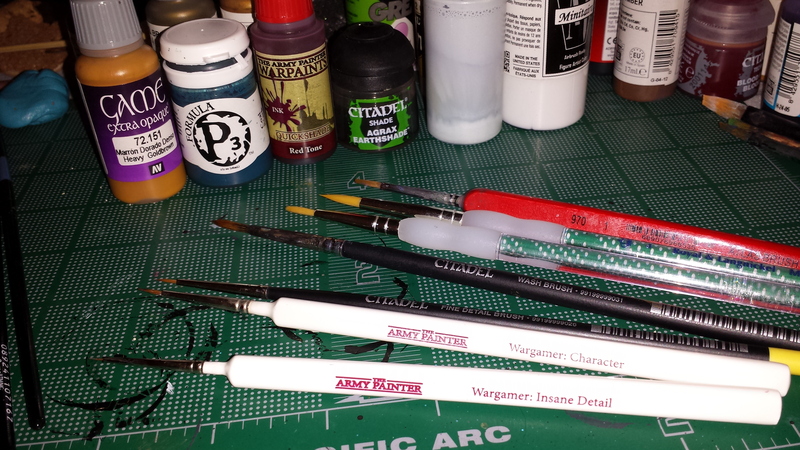 Beyond that we are also spoiled by choice, as almost every game company produces their own brand of paint brush, and there are entire lines that have been developed with the wargamer in mind. 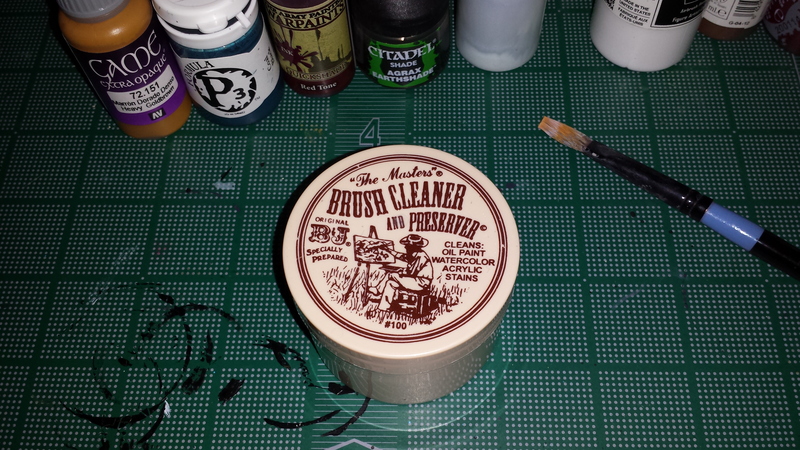 Synthetic brushes tend to be extremely cheap, usually only a couple of dollars per brush, but can range in quality. You will wind up replacing these more often than other brushes, but they can still serve you well if you're strapped for cash. Mongoose, Squirrel and other natural hair fibers, while they may be funny for you, are good middle point brushes cost wise. Ranging from as low as $5 USD or as high as $15 USD a brush. They offer more durability than Synthetic brushes, but vary in quality depending on manufacturer and can be difficult to find locally depending on your region. Sable brushes are the top of the line, as far as your choices go. Red Sable is the softer of the sables, and Kolinsky Sable is the most durable, but they are by far the most expensive brushes. I've seen some brushes exceed $100 USD for a single brush! So how do you go about choosing the type of brush that is right for you? Well, beyond cost, you need to consider your skill level as a painter. The better you are the higher quality brushes will appeal to you. 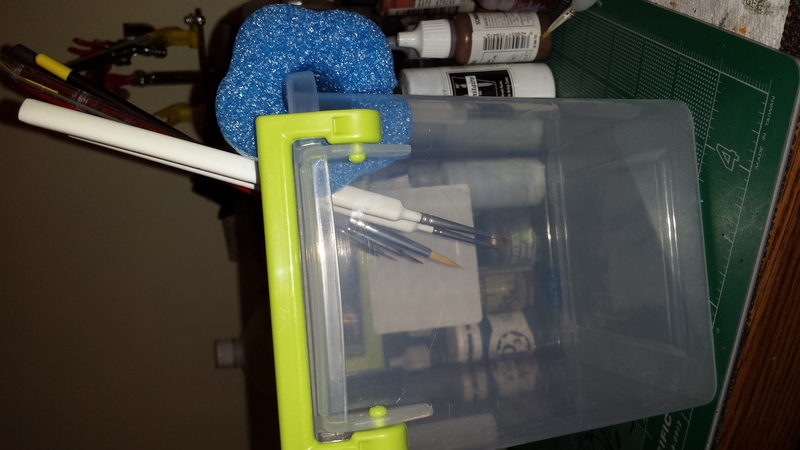 Windsor and Newton, a rather large name in traditional art, even makes their own line of miniature brushes called the Series 7. 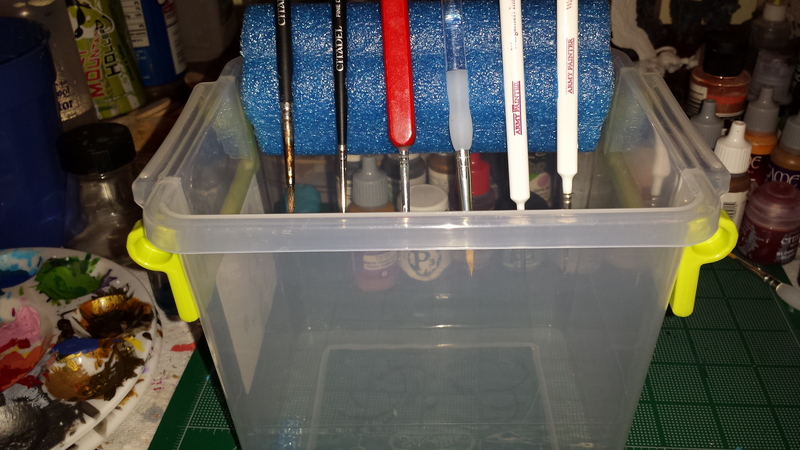 If you're just starting out, you may want to keep to the budget and synthetic side of the spectrum, or with brushes from miniature companies or miniature painting companies such as Games Workshop or Army Painter. Ask around, and in some rare cases local stores may have brushes on display for you to hold and feel and see if they are comfortable. 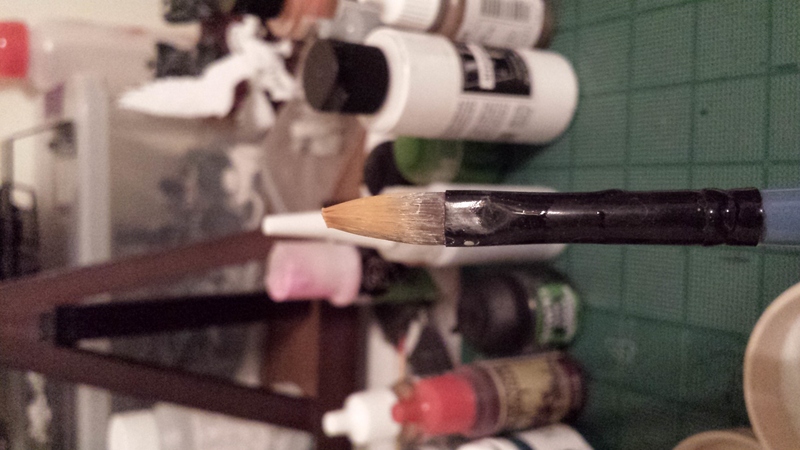 If you do decide to go with brushes not designed for minis, try to stick with shorter haired brushes with a sharp or fine point. Long haired ones can be unwieldy and difficult to use effectively. Now, I'm going to let you in on a couple of secrets here. 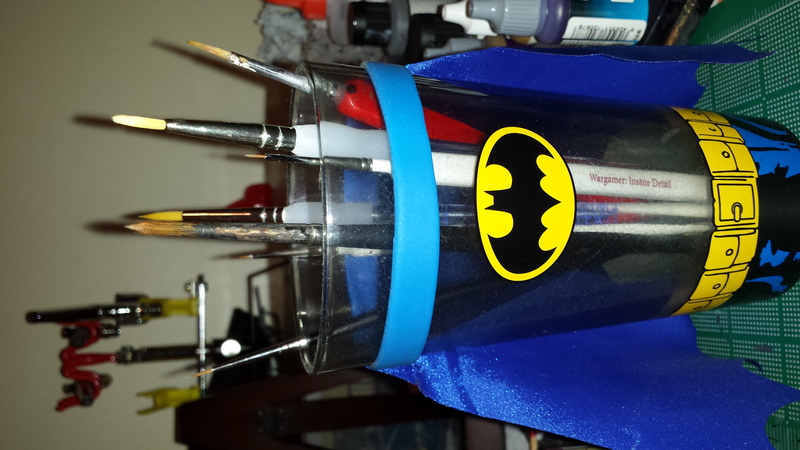 As a commission painter, I make a livelihood out of painting figures, and brushes are incredibly important for me. Now, a lot of folks think that I use only the top quality brushes, and while I do have a set of Windsor and Newton series 7 brushes for very special projects, I tend to be incredibly hard on my brushes and use mostly synthetic brushes or mongoose hair brushes for the majority of my painting and to mitigate any costs I incur from damaging my brushes. 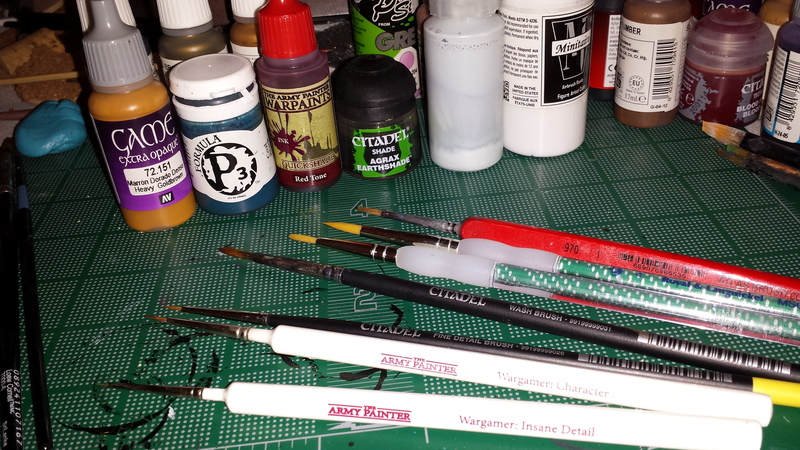 I do have a selection of brushes from Games Workshop and Army Painter for some specific applications such as Washes and super fine detail brushes, but most of my daily use comes out of brushes that cost less than $3 USD a piece. It is OK to have a wide variety of brushes from different companies and of different materials, don't think you have to maintain any sort of brand loyalty at all. 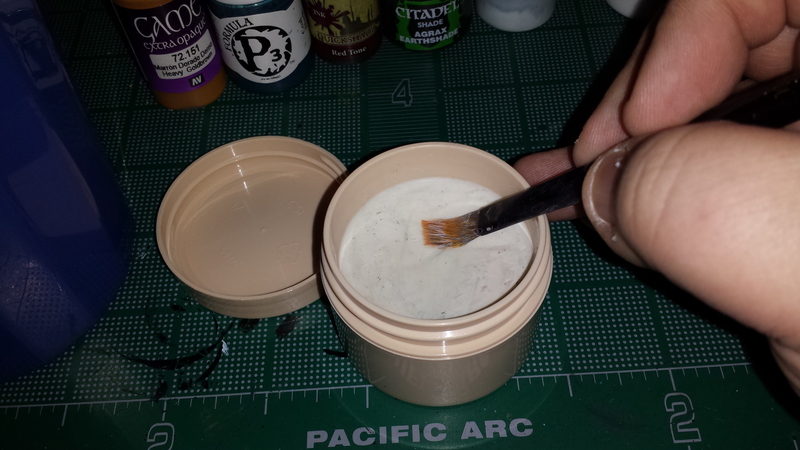 The second part of this secret is that, despite being the cheapest of the bunch, I get a long life out of those synthetic brushes. Proper care of your brushes in terms of cleaning and storage are probably the most important things you can do to keep your brushes working for you for a long time.